There are few things better than sitting around a summer campfire enjoying a delicious s’more. However, if you’re craving a s’more outside of the summer months, do not fear! Not only is this treat highly versatile, it’s incredibly easy to recreate. 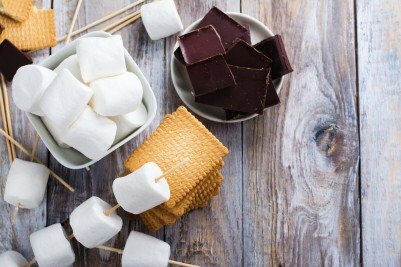 Ditch the notion that s’mores are a seasonal indulgence and check out these recipes that will help you enjoy them all year round. If your love for brownies rivals your love for s’mores, this recipe is for you. Try baking these cupcakes! They have three delicious sections to them just like a traditional s’more. With a graham cracker bottom, a fudge brownie middle and toasted marshmallows on top, you can’t go wrong with this dessert. There are helpful tips to make the preparation and execution of this recipe easy and fun. If you’re looking to bake something that is sure to be a crowd pleaser, check out this recipe here. This variation of a s’more is also a variation of a blondie. It’s incredibly simple and uses ingredients that are pre-made. For example, it calls for store bought chocolate bars and marshmallow fluff from a jar. The only thing you have to prepare is the graham cracker cookie dough. If you’re short on time but want to prepare a dessert that everyone will love, keep this one in mind. The entire dish takes only 40 minutes to complete. You can find this recipe here. This is a great way to get more of an authentic s’more without cooking one on an open flame. It requires you to bake the marshmallows to get them nice and gooey. You could even try broiling them for a couple minutes to get them toasted on top. This recipe is also incredibly simple and only requires you to make the graham cracker cookie dough as well. After that, it’s just a matter of toasting or broiling your marshmallows and adding a Hershey’s kiss on top. The heat from the oven will help melt the chocolate and make this cookie an excellent alternative to a traditional s’more. If you want to try this recipe, you can find it here. If you’re one of those people who considers fudge to be a Christmas tradition, think again! This rich, and flavorful fudge recipe will have you feeling serious summer vibes. The crunchy bits of graham cracker and pieces of marshmallow provide an amazing texture to the fudge. This dessert can be made with seven ingredients and prepared in just 15 minutes. If you are looking to expand your s’more related recipes or if you’re looking to expand your arsenal of fudge flavors, this is sure to be a hit. You can find this recipe here. The beauty of a s’more lies in the simplicity of it. Simple ingredients combined with simple preparation can yield something incredible. Indulging in different variations of this treat means you can enjoy a little piece of summer any time of year.